A few years ago Bridget Connors wasn’t sure she would live when a routine surgery went wrong putting her into a coma for months. 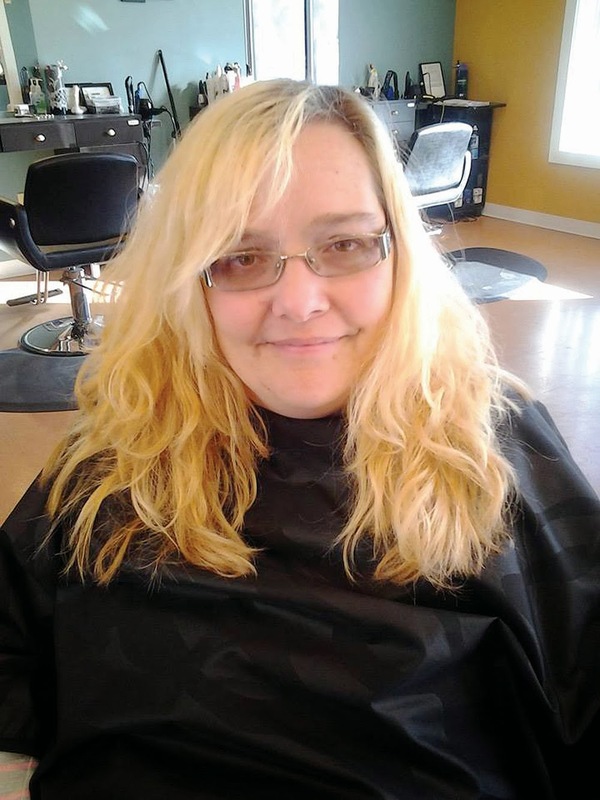 After many additional surgeries, a change in hair texture and lots of support from her friends and her three boys, Nykolas, Tyler and Isaiah, she was ready to take on the challenge of an Eagle makeover at Chic Boutique and Dr. Leslie A. Elston’s dental office. Smart-Damen Began by taking her lightened hair and deepening it to a warm light golden brown which really suited her skin tone and eye color. 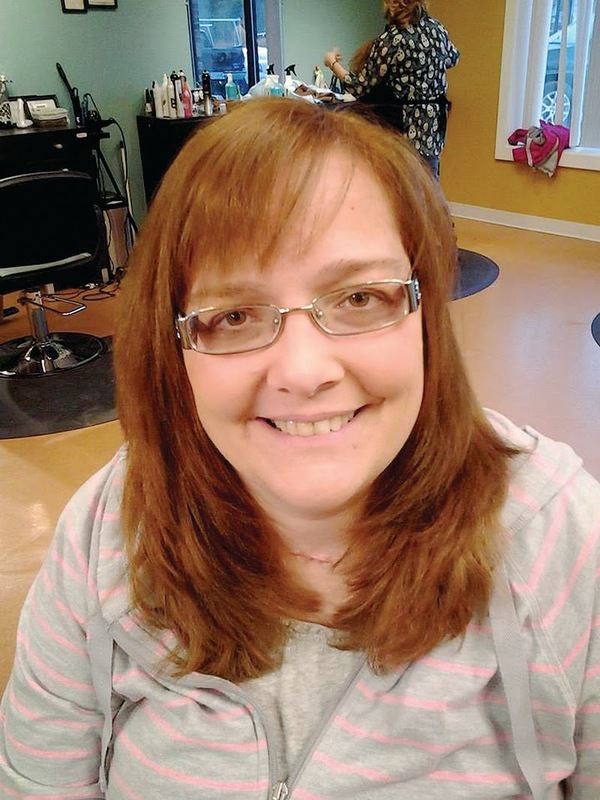 “We then shaped her hairstyle with a side bang and some face framing layering. We finished it off with a light makeup application,” Smart-Damen said. “It was a drastic change. My hair had never been that dark,” Connors said. “Everyone told me they loved the color.” However, after a week, Connors went back to Smart-Damen and had her add in some highlights to make it blonder. “Now it looks more like me. It was a pretty color, just too drastic for me,” she said. Connors then went to see the people at Dr. Elston’s office to have her teeth whitened. They used a 20-minute treatment and gave her a pen to follow up on her whitening. Connors said she would go back to Chic Boutique. She said she had only been to two hairstylists all of her life. “I feel very different going somewhere else, but I like the way she cut it,” Connors said. Connors is a medical assistant at Intermed. 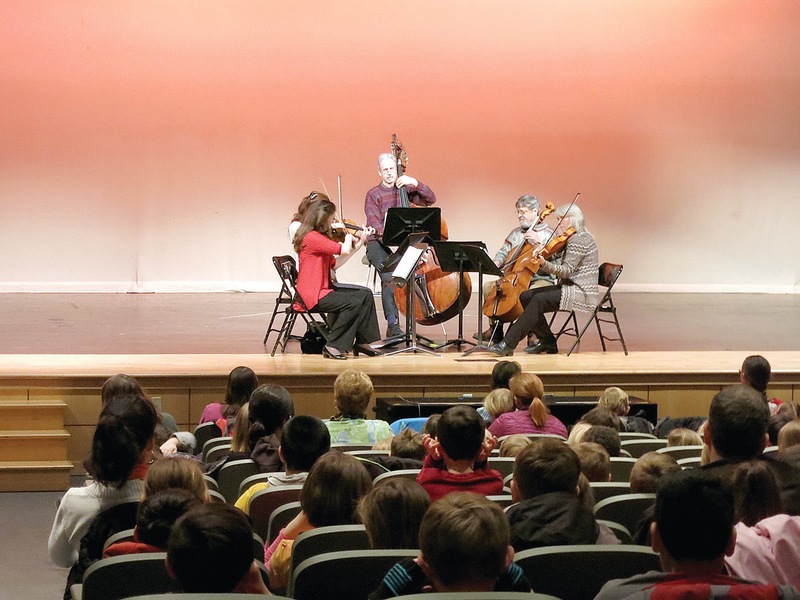 On Tuesday, February 4, more than 1,200 students from Windham Primary School, Raymond Elementary School and Windham Christian Academy attended KinderKonzert performances by string players from the Portland Symphony Orchestra. The students learned just how the sound is made on each of the stringed instruments. “The Elements of Music” was the theme focusing on melody and rhythm. Students from Mrs. Peavey’s second grade class loved hearing “In the Hall of the Mountain King” and “Frosty the Snowman”. They also wanted to thank the instrumentalists for demonstrating high and low sounds. This was an event sponsored by the Windham PTA with the Windham Primary School Cultural Arts Committee. I want to start off this edition of Foodie Fare by apologizing for my absence from the pages of The Windham Eagle. There have been a lot of things going on for me in the last two months that have really prevented me from taking ample time to write a valuable and decent article. That being said, since my last submission, something huge has changed – I have not been cooking as much – actually, in the last month and a half, I have only cooked a full meal maybe twice. I also haven’t been to a restaurant for a complete meal, either. You’re probably sitting there wondering what this Foodie Fare will be about if I haven’t been cooking or dining out. Here’s the kicker – since mid-November, I have lost 57 pounds. At first, I was alarmed because the weight was pouring off, but after consulting with my physician, my worries were quelled – since I have so much to lose, and I’m a male, when I lose weight, I have the ability to drop it fast. I’m not going to complain…yet. What I realized in late December is that my meal patterns had changed. As you know, I am a graduate student. What this all means is that when I’m sitting at home working on my homework, I’m not making huge meals. I have had very little time to cook. What I ended up doing is going for foods that I can grab and eat while working. This means veggies. This means fruits. This means cheese, and, of course, lunchmeats. My typical evening meal come mid-December consisted of one of the following: Carrots with hummus, a few slices of Genoa salami, and a few slices of cheese; or a salad with tomatoes, onions, salami, cheese, and avocado. Either way you slice it, my intake was far less than what I was used to and it was healthier choices. By late December, I was in the throes of a new style of eating – rather than living to eat, I was eating to live – this was a welcomed change for me. Now, my breakfasts, which before, could have easily consisted of a breakfast sandwich and large iced coffee from the local donut chain, have turned into a slice of toast with peanut butter. The carbs of the bread provide a source of quick energy while the peanut butter provides the longer lasting energy due to the high protein content. My lunches used to be a sandwich, chips and a veggie (sometimes). Now it is a half of a can of soup. Now, I’m facing the fact that I need to buy some new clothes – I’ve been told by many people at school that my pants no longer fit correctly – I take it as a compliment. My shirts are all comfortably big on me, and my favorite sweater now feels like a tent – It’s a great feeling, but I am sad that my favorite sweater must now be set aside. My only complaint so far is that I get cold very quickly. What excites me is how I feel – I feel so much more energetic – plus, my knees and back aren’t as sore anymore. So, here’s what I’ve given up. Soda. Huge meals. Rich foods. Sweets (which I was not a huge fan of to begin with). Most of my carbs. Not only does my body feel better, but I my appearance has finally changed. Mix in a shaker, if possible. The importance of self-love and nurturing one’s self is vital in order to love others. It’s so easy in our culture today to be instantly available to others via technology and before we know it, much of the day has passed. As a mother of two children and massage therapist and yoga teacher, I understand the importance of letting go of caregiving and taking time, even for a moment, so that I can rejuvenate. If not, I find myself unable to be fully present and positive for others. I wonder how often we stop and notice how we are breathing, (how deep or shallow it is), or take a break outside to feel fresh air on our skin, or notice how our bodies feel, or are aware of patterns of negative or positive self-talk. Do we acknowledge what makes us truly happy? The simple act of being aware and witnessing can create changes and shifts that are positive and life changing. As we go within, focusing on our inner world, that is where true wisdom and divine love reside. We just have to observe and listen. Some other ideas for self-care and love may be to eat wholesome foods, take a quiet adventure in the woods, journal or write yourself a love note, say positive affirmations to yourself, take a bath, sauna or hot tub soak, receive bodywork, take a yoga class, partake in your favorite hobby, exercise, and play or dance to music. Most importantly, remember to let go of judgments and have fun, laugh, sing and celebrate you! Rebecca LaWind is owner of LaWind Wellness, Massage Therapy and Yoga and Zen Den Youth Yoga in Windham. On February 22, youth classes will be offered at Raindrop Yoga Studio focusing on self-love at 9:30 a.m. and 10:30 a.m. To contact Rebecca, email columnist@TheWindhamEagle.com. 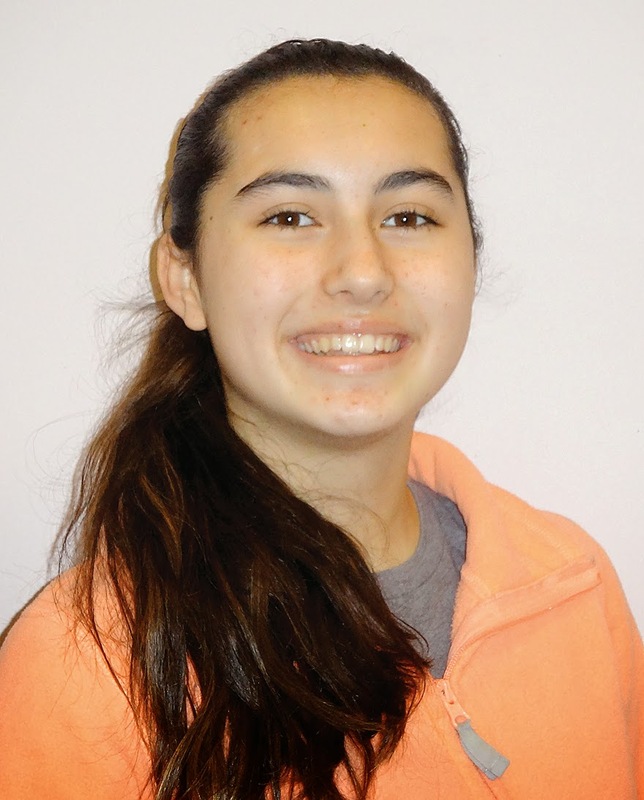 The Windham Eagle student of the week is Hannah Stogsdill, an eighth grader at Jordan-Small Middle School. “Hannah Stogsdill stands out as a remarkable person. She is serious about her studies and this is reflected by her academic success. Though strong in all subjects, Hannah is an especially capable writer in a variety of genres. She is an enthusiastic dancer and her diligence and good sportsmanship are visible on the basketball court as well as the soccer field. Above all, Hannah’s peers and teachers view her as someone who exemplifies acceptance, compassion and courage,” said her teachers. She has four cats and dogs, but she likes cats better. Her favorite subject is English language arts. Her hobbies are soccer, basketball, softball and shopping. Although if she wasn’t studying, she said she would be reading.